WOW, you can sure see you coming with those on....how well do they stay on and what brand are they? We get ice balls on our paws. We got them years ago and they're Muttluks. I think the simple rubber ones are a better choice now. They come in multiple packs and are meant to be disposable when they wear out and easily replaceable if one (or two) get lost! There is no way I would wear them. I can't wear ANYTHING! But mom thinks they look very nice! Sound reasons, but we don't think we'd wear them. We don't like ANYTHING on but a collar. Nice one Murray and looking good in those. Have a fabulous Friday. absolutely, you can walk till memphis or amarillo with that boots, I like the color together with your fur! You are so cute in your boots!! It doesn't even look like you mind wearing them! Some dogs really don't like them...but we put up with them when it is SO frigid out!! 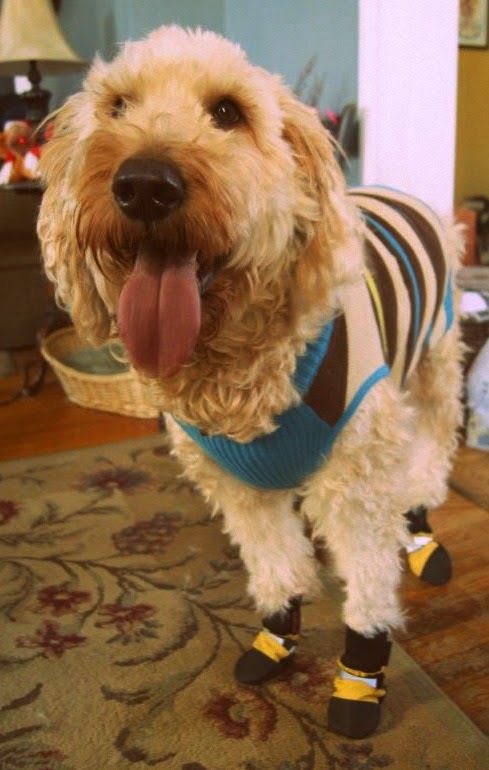 You look adorable in your booties! Mom has yet to buy some for us, we'd probably just rip them off each other! BOL!